“Queen of winter resorts” is part of ancient Thebes, the capital city of the Ancient Egyptian Empire. “It is a place which must be seen to be believed, for certainly in no other place in the world is so much beauty, interest and attraction, suited to all tastes and means, crowded into such a comparatively small area. This is how the Egyptians themselves praise Luxor and its twin-town of Karnak. Thebes, situated on the right bank of the Nile, was for long the most important of all Egyptian cities. 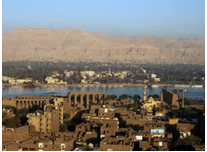 The expansion of this city began when Amenimhat I, an early member of the 12th Dynasty, united Upper and Lower Egypt. Its Golden Age was during the 18th, 19th and 20th Dynasties and then it was a world city, even by our standards. Here the Pharaohs created buildings truly worthy of Kings and on such a gigantic scale that even we, creatures of the Age of Technology, are deeply impressed by and marvel at the massive proportions of everything. Ramses II left more architectural relics than any other pharaoh; relief’s on the entrance pylon celebrate his victory over the Hittites. One of the two obelisks erected for his Jubilee remains; the other is in Paris. A great architectural achievement of ancient times, this vast complex embodies the work of several pharaohs from the 12th dynasty onward. An avenue of ramheaded sphinxes, uncovered only recently, leads to the Temple of Amun and the great Hypostyle Hall with 134 richly inscribed columns. Move on to the Temple of Amun Ra , the Obelisk of Queen Hatshepsut, the Festival Hall of Tutmose III, and the Sacred Lake. An impressive Sound & Light Show takes place every evening. Exhibition range from prehistoric to the Mamluk period-beautifully lighted and displayed. Take a motor launch to the other side of the bank; prearranged transportation can take you from there and beyond, although there are taxis, etc. if you want to go it alone. There is a tremendous amount to see so be prepared for a tiring visit; best to split the time over more than one day. More than 60 tombs have been discovered here; we have listed the most interesting and elaborate. Seti I - Tomb 17 : the largest and most impressive with intricate decorations in prime condition. Amenhotep - Tomb 35 : one of the deepest tombs with over 90 steps. Wall paintings are quite different here. Ramses VI Tomb 9 : one of the longest in the valley with exceptional drawing on the walls and ceilings of the chamber. Tomb of Nefertari (wife of Ramses II) the most outstanding but not always open to the public. Tomb of Prince Amenherk - hepshef (son of Ramses III) well preserved; the wall paintings alone are well worth the trip. Nacht - Tomb 52: scribe of the granaries. Ramose - Tomb 55: vizier of Akhnaton. Mena - Tomb 69: chiel of the king’s estate. Two gigantic statues, erected in ancient times to guard a temple which no longer exists. The mortuary temple of Queen Hatshepsut is an elegant, terraced monument at the foot of the Thebian hills is remarkably unusual when compared with other Pharaonic architecture. The fallen head of the Colossus of Ramses, which inspired Shelley’s poem Ozymandius, lies in the countryard. The mortuary temple of Ramses III is second in size only to the Karnak temple.